The Timberwolves shot 67.1 percent on Friday, the highest any team in the league has shot in a game this season. MINNEAPOLIS — In a rare season of losing in Los Angeles, discombobulated Lakers fans have taken to dreaming about Kevin Love in purple and gold. They see him as the savior, the young star they need to carry the franchise forward and help Kobe Bryant restore the team’s pride. Is it a pipe dream or a real possibility? It’s unlikely anyone will know until 2015, when Love can become a free agent and the Lakers will have money to throw at him. In the meantime, Love gave those suffering Lakers fans another performance to drool over. Love had 22 points, 10 rebounds and 10 assists for his second career triple-double and the Minnesota Timberwolves set a franchise record for points with a 143-107 victory over the Lakers on Friday night. "Everybody wants someone like that," Lakers coach Mike D’Antoni said before the game. "When you’re talking about one of the best players in the league, yeah that makes sense." Nikola Pekovic scored 26 points on 9-for-10 shooting in his first game back from an ankle injury and Love hit three of five 3-pointers in just three quarters of work. 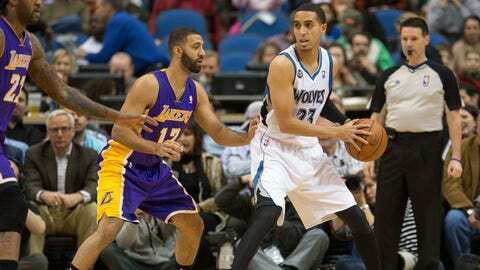 Kevin Martin scored 17 points for the Wolves, who led by 19 points in the first quarter, 37 in the second and 40 in the third. Steve Nash made a surprise appearance for the Lakers, picking up four points and six assists in 14 minutes of just his 12th game of the season. It was about the only notable development for the Lakers, who lost to the Milwaukee Bucks on Thursday night, then allowed the Timberwolves to shoot 67.1 percent, the highest any team in the league has shot in a game this season. "Terrible right now, man," Lakers guard Nick Young said. "It’s a bad feeling." Love put on a clinic during a masterful first quarter, scoring 15 points, hitting two of three 3-pointers, grabbing five rebounds and dishing four assists. He threw one of his trademark 60-foot outlet passes to Kevin Martin for a layup, threw down a dunk, hit a 3 and finished a fast break during a 20-3 run that gave Minnesota a 26-7 lead. He grabbed his 10th rebound of the game just before the third-quarter buzzer, and his teammates leaped off the bench and cheered his achievement. "Even with the team they have now, it’s still nice to be a team that’s been a heavyweight for a very long time," Love said of the Lakers. It was the quintessential Love performance — versatile and punishing from inside and out, unselfish and relentless. And it is everything the Lakers are missing right now. Kobe Bryant has missed most of the season with injuries, Nash is on his last legs and the Lakers are desperate for a star to carry them forward when Bryant, who will start a new two-year contract next season, decides to retire. Love went to UCLA and his father, Stan, played for the Lakers in the 1970s. Love can opt out of his contract after next season, at which point the Lakers will have enough cap room to sign him to a maximum contract. The Timberwolves remain confident that they will be able to do enough this offseason to upgrade the roster to convince Love, who has not been to the playoffs in his six seasons, to stay. President of basketball operations Flip Saunders has told teams calling about trading for Love to not even bother asking. The Wolves can also pay him about $26.5 million more than any other team. "My parents lived there and they had me there, so it’s not my fault," Love said of the fascination with him in Los Angeles. "I don’t really care about that right now. I just go out there and play and don’t really worry about it." D’Antoni coached Love with Team USA, so he’s well versed in his abilities. "He was a big piece in what we were doing and obviously he’s a big piece here," D’Antoni said. "Guy’s a good player. Wherever he goes, he’s going to be good." NOTES: Kent Bazemore scored 21 points and Jodie Meeks scored 19 for the Lakers. … The Timberwolves topped 40 points in the first quarter for the fifth time this season. … Xavier Henry sat out for the Lakers with a sore knee. … Timberwolves PG Ricky Rubio had 10 points, six assists, six rebounds and one steal, which tied Tyrone Corbin’s franchise for steals in a season with 175.